The Blue Green Wave (BGW) pilot site is located in the heart of the Paris-East Cluster for Science and Technology, in front of Ecole des Ponts. 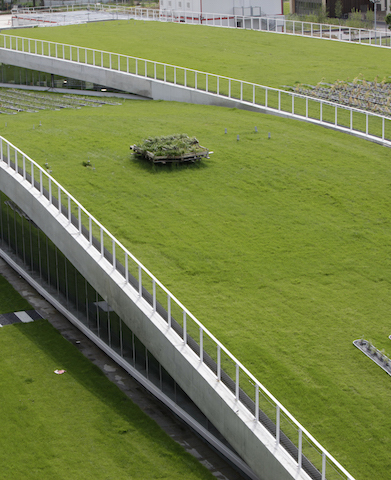 Since 2013 and the Blue Green Dream project, several monitoring campaigns have been conducted to better understand the thermo-hydric behaviour of this large (1 ha) wavy-form vegetated roof. The data collected are also used to characterise the spatio-temporal variability of the measured hydro-meteorological variables that usually exhibit a significant variability in space and/or in time characterised by a non-gaussian distribution and a scaling behaviour. Discharge flowing out of the BGW with several water level and velocity sensors implemented in the storm water system. To propose guidelines both in implementation and maintenance. 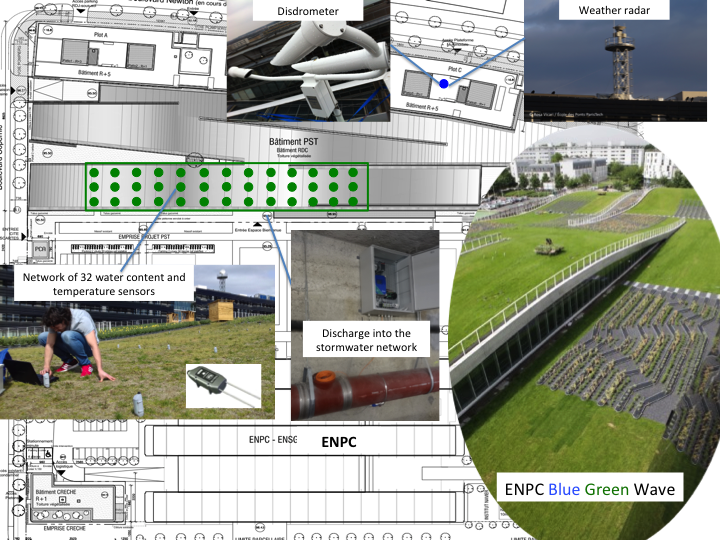 Measurements of precipitation (with disdrometer, top), volumetric water content on one slope of the Blue Green Wave (32 Wireless TDR Sensor, middle), and discharge in the stormwater network (bottom) for a particular rainfall event are presented in the video below. Huge variability of the water content values is the result of combined influence of slope and heterogeneity that will be the subject of future research. Additional experiments are planned on the GW in the framework on the ANR EVNATURB project that deals with ecosystem performances of Blue Green Solutions (BGS), and especially focussed on thermo-hydric fluxes. Versini, P.A., Gires, A., Fitton, G., Tchiguirinskaia, I., Schertzer, D., 2017. La Vague Verte de l’ENPC : un site pilote de Blue Green Dream pour évaluer les variabilité spatio-temporelles du bilan hydrologique d’une infrastructure végétale – ENPC Blue Green Wave: a Blue Green Dream pilot site to assess spatio- temporal variability of hydrological components in green infrastructures. La Houille Blanche. Accepted for publication.